Have you ever had Okonomiyaki? 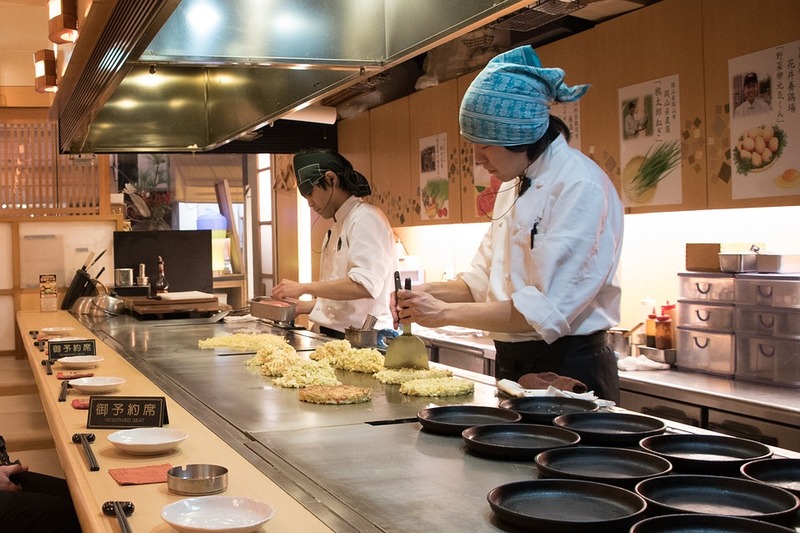 Okonomiyaki is a popular pan-fried dish which consists of flour, egg, and cabbage. Selected toppings and ingredients are added which can vary greatly (anything from meat and seafood to wasabi and cheese). This variability is reflected in the dish’s name; “okonomi” literally means “to one’s liking”. The dish is available all over Japan, but is most popular in the west, particularly the cities of Hiroshima and Osaka. It is usually filled with calamari, prawn or pork. In my hometown, Hamamatsu, we have our own unique version of Okonomiyaki called “Enshuu-yaki”. This is not famous but my favourite okonomiyaki. It consists of Takuan (yellow pickled radish), Beni-shouga(red pickled ginger) and Negi (spring onion) which make it very colourful. We put soy sauce on it instead of okonomi sauce and Enshuu-yaki is thinner than regular Okonomiyaki. After World War 2, there were a lot of poor people in Japan. The people in Hamamatsu wanted to make issenyaki (old style small okonomiyaki), however, they could not afford seafood and meat. Instead of that, they put Takuan since it was easy to get in Hamamatsu area. People shared this thin okonomiyaki with their family. It was called “Binbo-yaki” which means a poor dish. When I was a child, I used to buy Enshuu-yaki at Dagashi-ya (Traditional cheap snack and sweet store for children). It was 50yen (50 cents) and we cooked and ate it at the store. Enshuu-yaki always reminds me of my childhood memories. Nowadays, it is still called ‘Okonomi’ familiar by Hamamatsu local people. I actually had never had a ‘real’ okonomiyaki until I was 18. I thought that Enshuu-yaki was real okonomiyaki and when I moved to Tokyo I realised that Enshuu- yaki was a unique type of okonomiyaki. Please try Enshuyaki when you visit Japan!